Timing. Had this come out years ago it could have had the sensational impact of Tyler Hamilton’s Secret Race given it details doping on the US Postal team. But coming out in 2014, long after the USADA report it’s a very different matter. If the book has generated headlines about Tramadol and race fixing this isn’t a tale of scandal. Most of the intrigue is reserved for the unreported aspects of the life of a pro cyclist, from injury to travel. Scandal accompanied the book’s launch but this is the story of Barry’s career in the peloton from early days in Canada to amateur life in France and then a pro career. Yes there are doping revelations but they’re just part of what happened along the way. Willie Nelson quipped the early bird gets the worm but the second mouse gets the cheese and Barry’s in the latter camp, this is not a book designed for the shock factor. Even when describing the way Tramadol was given out at Team Sky Barry questions the practice but doesn’t get outraged, just disappointed. The text continues and insinuates the blond amateur was abusing cortisone. 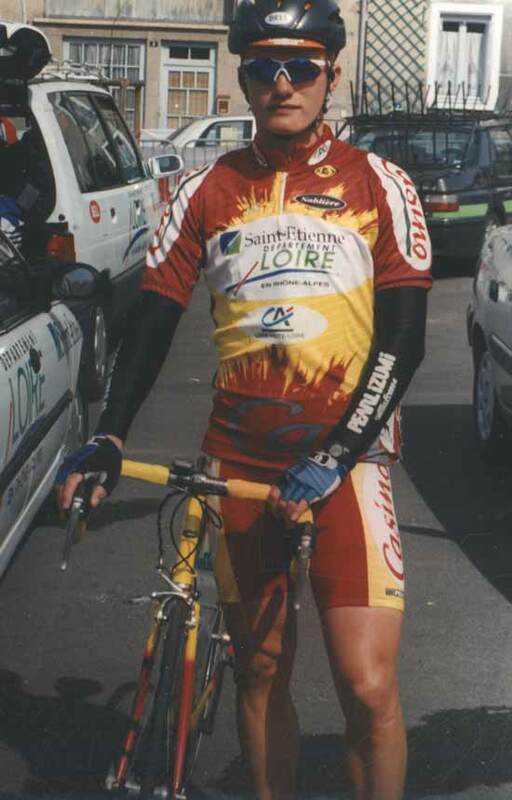 Who could this stocky blond rider in a yellow and red St Etienne jersey be? But don’t read this for the dirt, more words are dedicated to broken bones or his time spent as an amateur in France. Barry has written this himself, no ghostwriter and it’s full of descriptive and often poetic phrases – “lawns were a lush green, full of moisture, yet to be bleached by the summer sun“. He uses the first person plural in the present tense a lot – “We begin to pedal a steady rhythm, cars pass us” – as device to explain not what he did as a pro cyclist but what is done every day by professional cyclists. The book isn’t chronological ride through Barry’s career. It opens with a prologue about a call from USADA and then Chapter 1 describes a taxi ride to the airport before Barry flies to Doha for the 2012 Tour of Qatar as he experience the same pre-season anxiety that he and others have long felt. Incidents allow him to jump back, a crash in a Qatar is used to describe an incident from the past. It might confuse some but worked for me and ensures the book isn’t a dull list of races and results, it’s more a collection of insights and experiences. It’s not a comprehensive autobiography. There’s a mention of Dede and a few pages later he’s been married to her for three years. There’s little on other personal details like tastes and beliefs; there’s the odd mention of prayer and the loss of a crucifix in a crash. As such most of the tales involve moments when he’s wearing team kit and of the ones that don’t, he’s probably wearing a hospital gown. As well as looking back Barry makes wider points about the sport with calls for improved health and safety and rider rights but often these aren’t explored very far, he wants courses to be made safer but doesn’t say whether this means excluding urban finishes, bulldozing roundabouts or abandoning the cobbled bowling alleys of Flanders. He quizzes a team doctor about Tramadol use saying if users are advised not to operate machinery, why is it being used to operate a bike and what happens in the event of a crash and a health insurance claim? It’s all valid point but skip a few pages to see him rationalising EPO abuse and telling lies to protect his job. He might quiz the practices of today’s generation but he and his peers surely owe them an apology first? Many have formed a view of Barry already. Canadians and Team Sky fans might like him; others angered by the US Postal scandal. Certainly the idea of people cheating and making a fortune, getting a token ban and then topping it off with a book deal is awkward: shouldn’t we all be reading David Moncoutié’s bio instead? So if you don’t like Barry should you read this? Hard to answer and the poetic style and impersonal “we” often means he’s not arguing his case, the book might not challenge your opinions. You could read it as the tale of an ordinary domestique but Charlie Wegelius got there first. You could read it for the dirt on US Postal but Tyler Hamilton got there first. You could read it for the life of a pro who’s consumed by self-doubt and confesses to doping but David Millar got there first. But if others have been there before it’s still readable: read this if you’ve read those tales and want more. Note: this copy was sent free for review. It is published by Faber and Faber and available in print and electronically. Barry’s an excellent writer in my opinion though I disagree with some of his rationalizations and ideas. The previous Postal Bus book was enjoyable despite whitewashing the whole Postal mess. In some ways writing is as much a business as passion, eh Michael? If this book’s available on Kindle I’ll get it right away to help fill the void left by the Giro d’Italia’s end. Confessional books and Gran Fondo appearance money. Social Security for doping bike racers. After his earlier book/photo-essay ‘Le Métier’ I remember one or perhaps two dissenting voices translating ‘métier’ in the context to include the proper ‘preparation ‘ and not just the literal translation of trade or profession. Chapeau. I remember thinking at the time that M Barry was one of the good guys, not just one of the guys. In Barry’s case, what cheese would that be? It’s more the mousetrap jaws clamped shut on others. If Barry had been first to tell all about US Postal/Armstrong he’d have been on the receiving end of all the commentary directed at Landis or Hamilton. Slipping this book out later lets him tell his story but without too much to worry about. I think your right, it is difficult to know just exactly how to feel about ex-dopers still making good money from the sport. Michael Barry is such a case. I am sure he is a perfectly nice guy if met in person. The thing that gets me though is that there were a lot of riders who were content to stay quiet until Jeff Novitzky appeared at their front door, which arguably gave rise to the whole USADA reasoned decision thereafter. For me personally, this is much, much too late. I own hundreds of books. Barry’s first book (titled something about the postal bus) was one of the only books I’ve ever owned that I threw in the trash after reading. After the dishonest commonplaces of the first book, I can’t imagine that he has anything worthwhile to say in this one. I’d say save your money.